The SuperTurbo-X44 delivers great 2D flexibility when floor space is limited. This compact dynamo offers a unique 4′ x 4′ table design for easy accessibility. 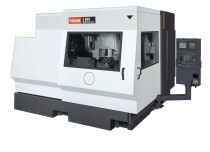 The STX-44 utilizes a meehanite frame which greatly reduces vibrations that occur with high-speed cutting. This results in consistent, superior accuracy and low maintenance requirements. A completely enclosed cutting area meets FDA Class 1 safety standards, providing a safe, clean work environment. The SuperTurbo-X Champion offers rugged construction that delivers higher accuracies. It is designed for operations cutting workpieces up to 0.87″ CRS depending on material quality. High performance and a wide range of application offers job shops a competitive edge. A 2 pallet changer design with a rack and pinion positioning system that features high through-put and rugged construction delivers a combination of performance and value. Features the new Preview 3 control with a touch screen and a new Type 10 resonator with ECO mode that reduces operating costs.